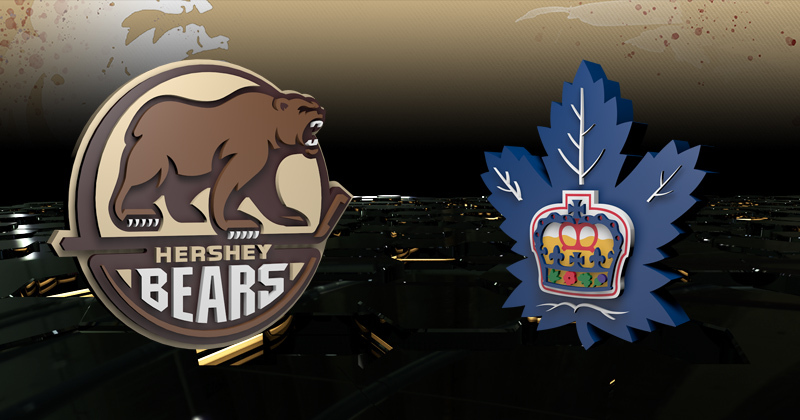 Game Preview: Marlies at Bears, 7 p.m.
03/15/2019 - (Hershey, PA - March 15, 2019)- The Hershey Bears host the Toronto Marlies tonight, American Hockey League affiliate of the Toronto Maple Leafs. The Bears enter tonight's game with points in four consecutive contests. The Hershey Bears erased a 2-0 deficit and came away with a 5-3 win on Wednesday night over the Springfield Thunderbirds. Late in the second period, the Bears scored two goals only 1:09 apart to draw even at 2-2. Ryan Sproul got the Bears on the board with a center point blast at 17:18 of the second frame, followed by a Devante Smith-Pelly power play goal. Mike Sgarbossa and Jayson Megna both tallied in the third to grab a 4-2 advantage, and Sgarbossa added an empty net goal in the final seconds to solidify a 5-3 final. The Toronto Marlies look to rebound after dropping a 5-3 decision on Monday to the Belleville Senators. Jeremy Bracco, Vincent LoVerde and Adam Brooks scored for the Marlies. The Marlies enter tonight's game as the defending Calder Cup Champions. Toronto captured their first Calder Cup in franchise history with a 6-1 win on home ice in Game 7 over the Texas Stars on June 14, 2018. Prior to the Calder Cup Finals, Toronto swept past the Lehigh Valley Phantoms in the Eastern Conference Finals and the Syracuse Crunch in the North Division Finals. Chris Mueller is a returner on the Marlies roster this season after tallying 16 points (four goals, 12 assists) in 20 games during the playoffs. Bears forward Jayson Megna has tallied a game-winning goal in back-to-back games for Hershey entering tonight. In his last three, Megna has earned seven points (three goals, four assists) after snapping a six-game drought without a point. The Ft. Lauderdale, Florida native scored an insurance goal last Sunday in Hartford to provide the Bears a 4-2 lead against the Wolf Pack prior to a 5-3 final. Megna followed up his performance in Hartford with a three-point night on Wednesday (one goal, two assists), and again tallied an insurance marker to provide his club with a 4-2 advantage before winning 5-3 over Springfield. Mike Sgarbossa's two-goal performance on Wednesday night earned his 99th and 100th career professional goals. The Campbellville, Ontario native has scored 98 goals at the American Hockey Level, and twice in the National Hockey League with the Florida Panthers during the 2016-17 season. In one season with the Chocolate and White, the seventh-year pro has displayed a career season, setting a new high in goals (26) and points (53). Tonight marks the return of former Hershey Bears captain, Steve Oleksy to Giant Center as a member of the opposition. The 33-year-old veteran blueliner was named the 42nd captain in team history during the 2014-15 season after the team's original captain, Dane Byers, was sidelined with a season-ending shoulder surgery. This season, Oleksy has split time with the Marlies and the San Siego Gulls, appearing in 15 games with each team. Oleksy last played against the Chocolate and White as a member of the Marlies on Apr. 8, 2017. His last game played at Giant Center came as a member of the Wilkes-Barre/Scranton Penguins on Oct. 23, 2016.